Still sketching doodles for my own amusement, but I might as well post something I liked out of the bunch. No, there's nothing perverted here, honest. Unless you happen to count "mix-and-matching Napoleonic, Regency Britain, Gothic Armor, and post Revolutionary War US fashions willy-nilly" as a perversion, which would mean I've been very naughty. Here's a few thumbnails, lazily composed, of the Great Belnesarian Empire's modern military fighting force. They have shakos. Okay, so maybe Aumetz's armor isn't all that Gothic anyway. There's a bit of fluting there, honest. It's just a pain drawing all of the fluting. I decided to keep it to the elbows and flares. Imperial troops wear a superlight flak jacket with ordinary fabric covering it, so that it looks like an ordinary coat, in theory. In practice, everyone can see the armor plating anyway, but modern uniform designs incorporate the armor as part of the fashion. And I do mean fashion. With the exception of certain special forces and reconnaissance units, the concept of camoflage seems to be beyond them. This would probably be more of a problem if their magitechnology wasn't comically, and ironically, superior to the technology used by most of their potential military rivals, including that of the Blueworld's superpowers. A .50 cal Mk211 Raufoss round, such as those fired from anti-materiel rifles including the much-vaunted (even by idiots) M82 Barrett, would probably not pierce the basic armor plating. Though it'd hurt like hell. (Unless the round had been enchanted with anti-armor and anti-warding spells beforehand, at which point it'd leave quite the mess.) Even dedicated anti-ward, anti-armor rounds have difficulty penetrating the Halfarmor equipped by Cuirassiers and other heavy infantry, though. This is because "Halfarmor" is GW parlance for "ward-enchanted powered armor." What they consider "Fullarmor," interestingly enough, are Armor Frames. Anti-ward, anti-armor Enchantment-Charged close combat weapons, on the other hand, usually have integrated magic circuitry and essence capacitators inside of the body of the weapon itself--greatly increasing the strength and integrity of the offensive enchantments required to overcome most defensive measures. This means that the guy with the sword is probably more of a threat than the guy with the assault rifle. Cuirassiers, Voltigeurs, and Dragoons--the Empire's three elite close combat specialist regiments--are all issued Charged weaponry as a matter of course. Officers have the option of going one better. 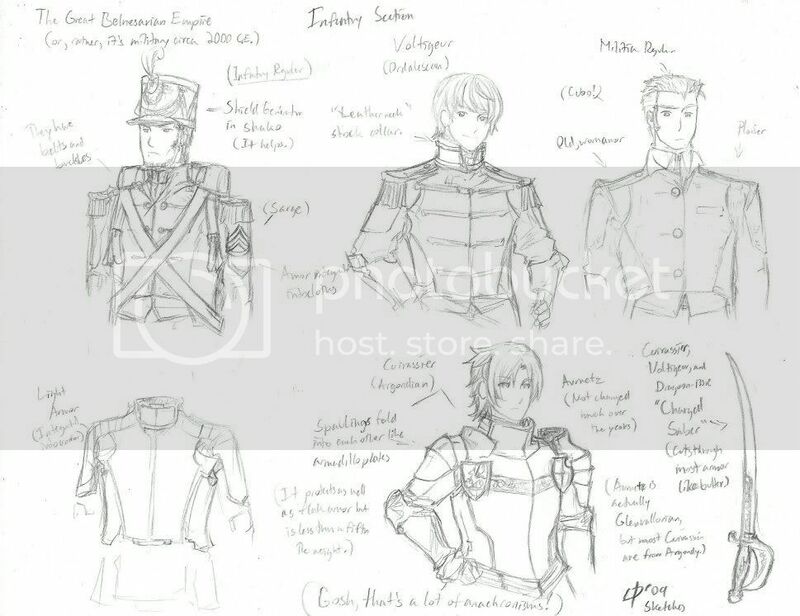 EDIT: I note that while historical Cuirassiers were cavalry, and Dragoons sorta-cavalry, the units named after them here are all infantry. Some more mechanized than others. Dragoons on another page. Sadly, aiming for the headshot will rarely accomplish much. Ward-integrated armor generates a passive defense shield around the entire wearer, using the wearer's own life force as a conduit to support the shield itself. Anti-ward weapons for use against personnel, first and foremost, are designed to overcome this layer of defense. Shakos, helmets, and even gorgets with integrated shield generator circuits, combined with the wardings provided by the base armor itself, can make the head the least vulnerable spot on the entire body. Unfortunately for most grunts, they're stuck with the cheaper and heavier shakos, while officers and Magi get the expensive and super-light gorgets, circlets, and even choker necklaces. They provide the same level of protection as the Big Hats but weighing so little as to be negligible. When it comes to magical equipment, the Belnesarian Empire does not mess around. So. The idea that the army of an Empire whose troops look like they're about to get their asses handed to them (and their women seduced) by Sean Bean could potentially conquer the whole Earth (or the next best thing, the BW), amuses me greatly. But that's not likely to happen, because reading back on older posts on this LJ, apparently they're the good guys! Now the Federation, those guys are bastards. Even more than the Republic, which isn't exactly a very benign power, either. EDIT: Though it's hard to take an Empire seriously as a threat when they're an Expy of the French Empire. Most of that went RIGHT over my head. Then I'll edit this post and put in Way Too Many Hyperlinks just for you, Ming. I have one thing to say about the one at the top left. Nice hat is nice. "The shako makes the man."